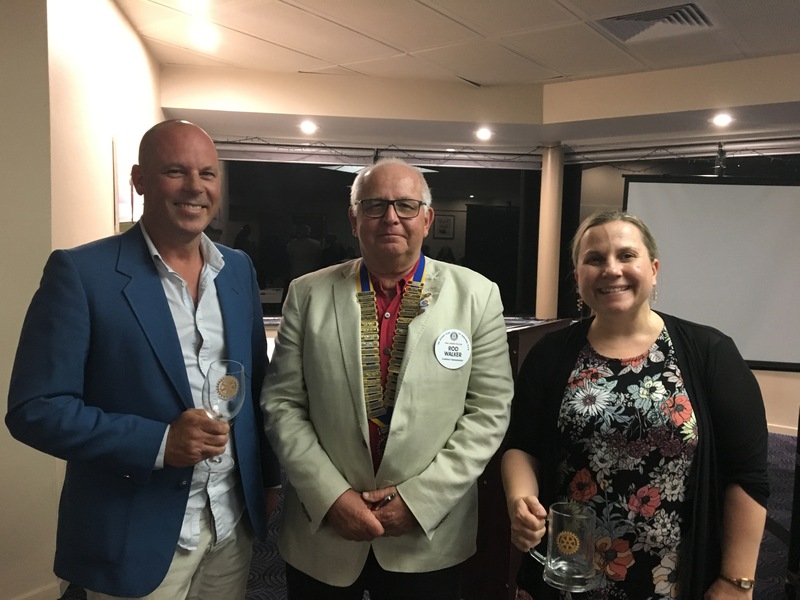 October 2018 – Narooma Rotary Club Inc.
As I write this I am laid low with a cold so Rod’s Ravings may be a better title. 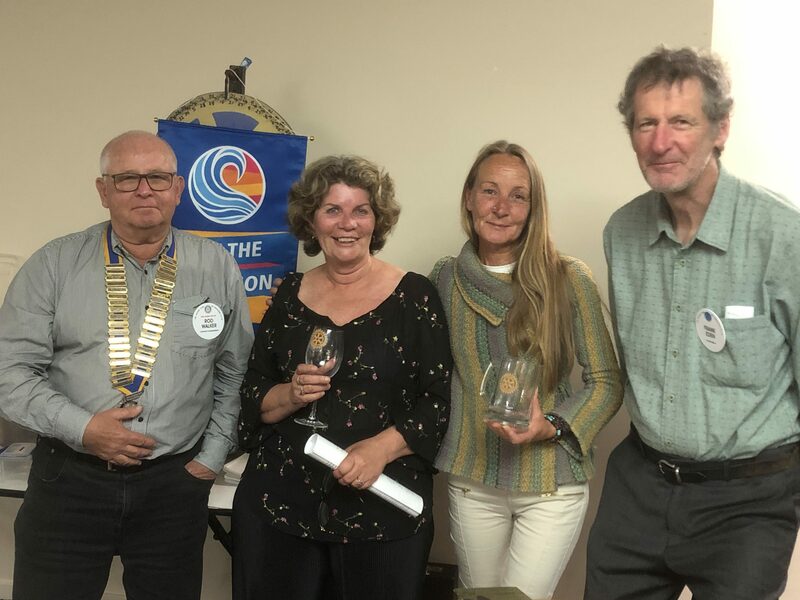 Last week’s meeting had a great vibe due to the unexpected attendance of three Rotarians and two partners from Victoria and our regular visitor Rotarian Gordon. 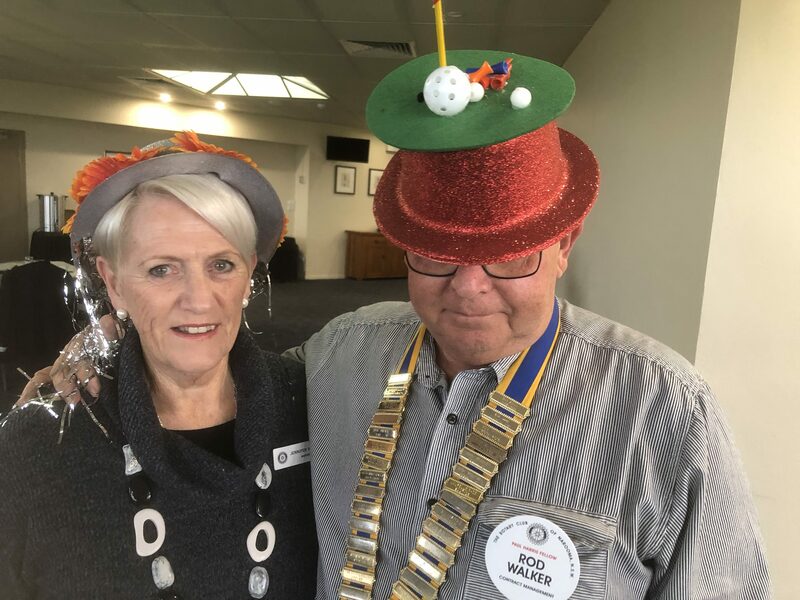 “Older” members tell me that visiting Rotarians was a regular feature of meetings in the past as Canberra Rotarians came to Narooma for holidays. I am thinking of writing to all the Canberra clubs reminding them we are here and encouraging them to visit. What do you think? A couple of weeks ago Luke Burgess the Maintenance Manager at Dalmeny IRT emailed me to ask if Rotary was interested in some old wheelchairs, walkers and other equipment no longer suitable for use at the Care Centre. I emailed Fred Fawke to see if he and RAWCS were interested, well at least I thought I did! I was actually using an incorrect email address. When I realised my mistake, I made contact with Fred on Friday afternoon. 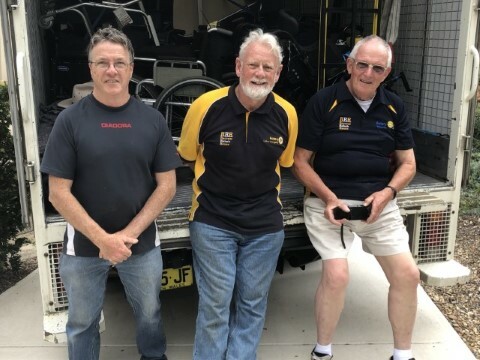 Believe it or not Fred was on his way to Moruya with a three-tonne truck to pick up some hospital beds, so on Saturday he was able to continue on to Dalmeny to pick up all the gear. We managed to load a heap of old wheel chairs, walkers, walking sticks and other bits of pieces onto the truck before the rain struck. I understand that the gear will be sent to Sierra Leone. 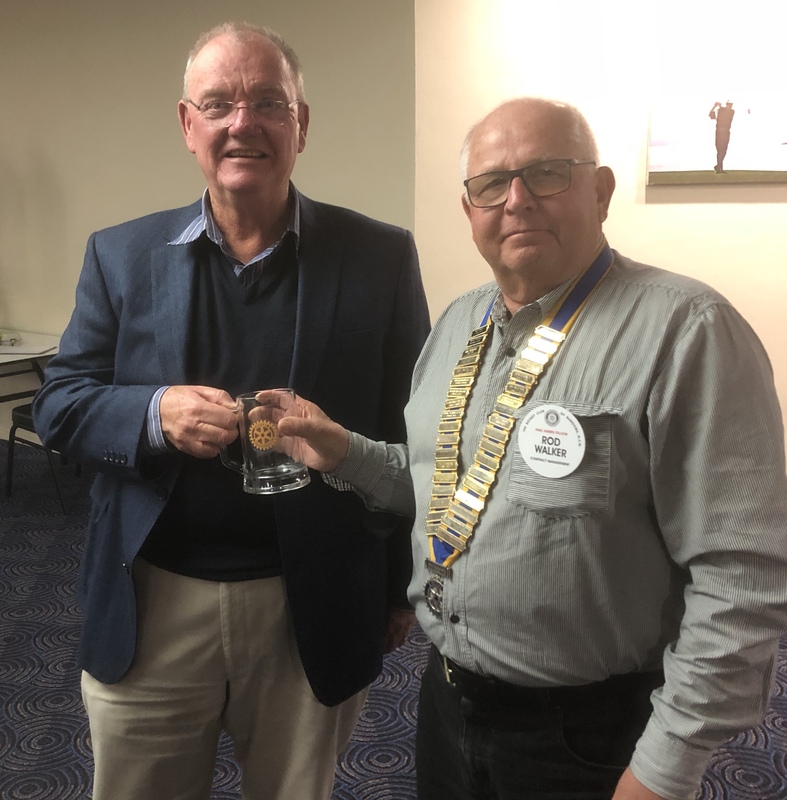 Thanks to Fred Fawke and Brain Goldstraw (Gungahlin Rotary) who picked up the gear and to Luke Burgess and the IRT who made a very generous donation to help Rotary International projects. Luke Burgess (Dalmeny IRT), Brian Goldstraw and Fred Fawke with the truck loaded with gear donated by the IRT. I also made a quick trip Moruya Rotary’s Renewable Energy Expo on Saturday afternoon. 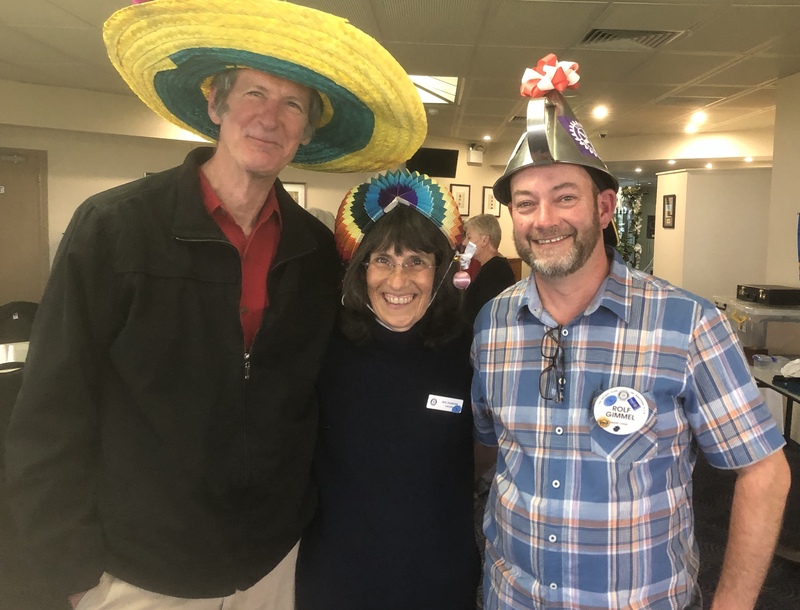 Although the number of exhibitors and visitors were less than what we had experienced when our Club held the event at the Leisure Centre it was great to see the Moruya Club take up this important initiative. Thanks to Frank for all his enthusiasm for the event and to Phil Armstrong and his team from Moruya for taking the event on this year. Hopefully, we can bring the Expo back to Narooma in 2019 with Moruya taking it up again in 2020. Members are reminded to advise me by 4:30pm on the Tuesday prior to the meeting if they are an apology for our Thursday meeting. If you are bringing a guest, please also let me know by 4:30 each Tuesday. Preferred format for letting me know is email. I take my hat off to last week’s meeting where members recognised the scourge of mental illness in our society and highlighted Rotary’s efforts to combat this insidious disease. 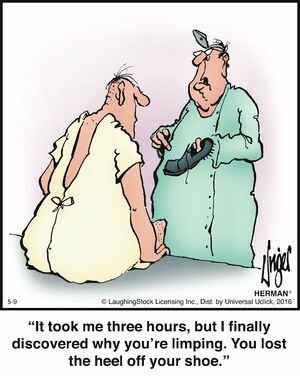 Like Australians often do we reflected on the impact mental illness has on families by doing something funny. A funny hats theme was the order of the day. Thanks to all who participated and to our guest judge Therese (is that how you spell it Bob?) Aston. Keeping with the theme guest Dr John Brown gave a brief but insightful presentation on how mental illness can manifest itself. It was a pleasure to have John and wife Larry with us at Rotary. We have some great speakers coming up before the end of the year. Title: Your Health and Retirement Nancy Casu is a fitness specialist, personal trainer, author, speaker and presenter on the subject of ageing and functional fitness. She earned her degree in Health Science (Leisure & Health) at Charles Sturt University and has fitness specialist qualifications. Nancy believes we should live our lives to the fullest, live with no regrets and keep a positive attitude. have a vast network of local service providers that we can link people with. Reynolds in Hobart in August 2018. Attendance – 9 members, 8 visitors, 1 club guest & 1 visiting Rotarian. 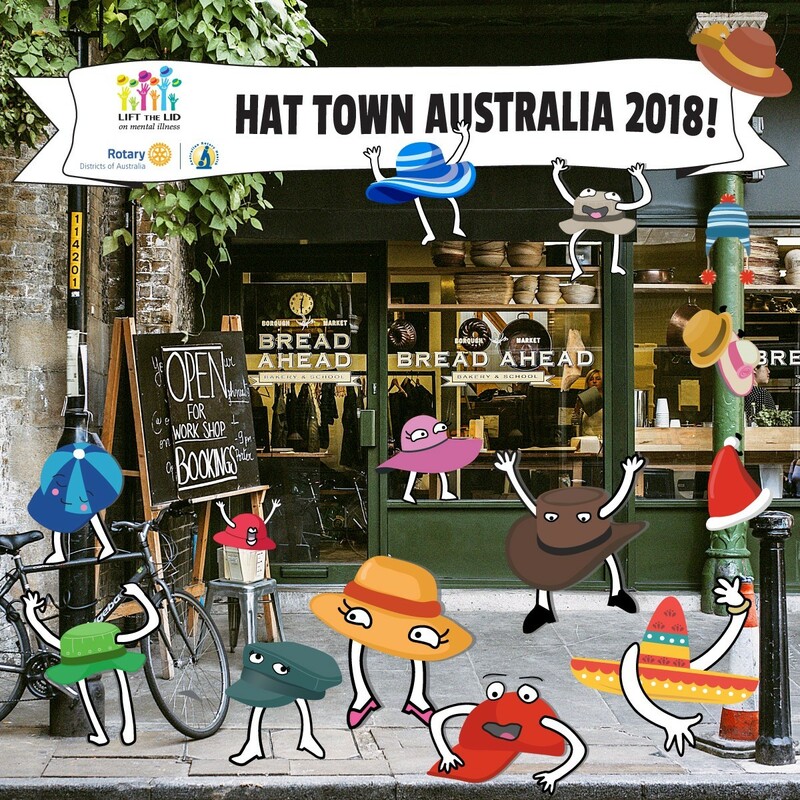 3-Minute talk – Chris O’Brien on all things hats, followed by a hat quiz. AGM Thursday 13th December – this will be our last meeting for 2018. The next time we meet will be Thursday 31st January. We will organise a social event in January if there is interest. Saturday 15th December Christmas Party venue to be confirmed but probably Casey’s. It was also decided that the proceeds from this year’s Duck Race will go to our Tertiary Scholarship fund. AGM it is a current year vacancy. Talk to me if you are interested. Our next community activity will be our Market on the 28th October combined with our volunteering expo. We need all hands-on deck for this day. Please let John Doyle know your availability ASAP. In particular we need someone to tow the van on that day. If no one is available we may have to forego cooking at this market and again in November. We will also need people on the Rotary stand. Next on our community agenda will be Carols by Candlelight on Friday 14th December commencing at 7.30pm. We will most likely be doing a sausage sizzle. Then its 2019 and we start the year with the Duck Race on Saturday 26th January. If you already know you are NOT available can you let Charmaine as soon as you can. Membership was discussed the Assembly with a number of suggestions on attracting members tabled. Including the use of social media and holding a free event with food to capture interest from the broader community. The Assembly agreed to set up a small committee to develop some other strategies. Chris, Frank, Lyn and Ange are on the committee but I am sure they would welcome anyone willing to help. At the next meeting we will be celebrating Hat Day and all attending are asked to wear their best or worst hat. Special guest will be Dr John Brown. Raffle: Winner of the wine – John Rungen. Preliminary steps were first made to organize the Club in the Philippines in January 1919 through the interest and agreement of Leon J. Lambert. In June 1919, the Charter No. 478 authorized the Rotary Club of Manila (RCM) to operate as a formal organization under Rotary International. The Rotary Club of Manila was both the first Rotary Club in the Philippines and the first in Asia under the direct supervision of the International Association of Rotary Clubs (now Rotary International). The Club went on to organize its daughter clubs, the Rotary Club of Cebu in 1932 and the Rotary Club of Iloilo in 1933. Rotary Club of Bacolod and Baguio were also established later on. The Rotary Club of Manila was also responsible for organizing the Rotary Club of Guam as its first overseas daughter Club in 1939, through the efforts of then R.I. Vice President Carlos P. Romulo. During World War II meetings of its members were only held if circumstances allowed. This period lasted from May 1942 until it was reorganized in 1945. Many other Rotary Clubs were subsequently established in the Philippines. There are now over 800 Rotary Clubs in the Philippines, and their members are among the most active when it comes to serving the Filipino community and helping those in need.